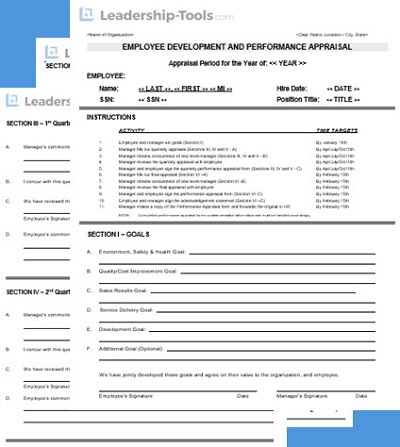 Our free sample performance appraisal form comes complete with a six part series that provides instruction and helpful hints for leaders who want to make the most of the time they invest with team members during their employee performance reviews. You'll be able to use this valuable tool over and over again, with quality results. You want discussions with employees to benefit the employee, the team, and the organization. The time you spend discussing the progress and success of your employees is critical to employee retention and the success of the team - great leaders make this time count! The performance appraisal is a critically important task for every leader. Maintaining open and direct lines of communication with your team members is key to maintaining a positive work environment and a healthy relationship with the employee. Holding regularly scheduled one-on-one discussions and performance reviews are essential for every leader and the organization as a whole. Conducting performance appraisals help to clarify company standards, your expectations and the responsibilities of the employee. These discussions also enable you to connect with associates and ensure all parties are on the same page. Discussions with employees provide a great opportunity to recognize them for their performance as well as identify training needs and establish an employee action plan for professional growth and development. Most importantly, performance appraisals can help foster positive relationships between management and front-line staff. Employee performance appraisals are a critical part of the management process and therefore should not to be taken lightly. In addition to providing our sample performance appraisal tool for your immediate use, we've also created this six-part series to lead you through the entire employee evaluation process. Remember, issues discussed during an annual performance review should never come as a surprise to the employee - unless you are informing them about a promotion! By using this guide you will be better prepared for one-on-one discussions and your next round of annual performance reviews. "The employee performance review is when you get together with your team leader and agree what an outstanding member of the team you are, how much your contribution has been valued, what massive potential you have... and in recognition of all this, agree to doing more for less." 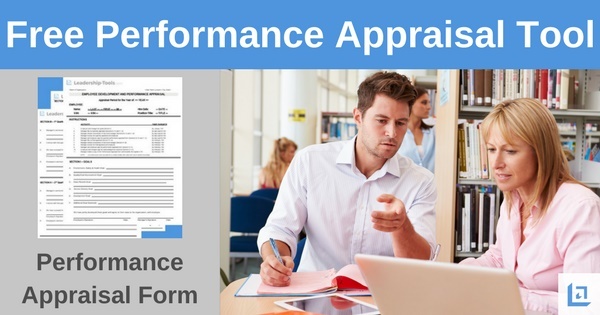 It's fair to say that with minimal research online or at your local library, you can find a variety of free performance appraisal forms that you can utilize for the purpose of conducting annual employee reviews. We know this to be a fact because that's the first thing we did when setting out to provide a quality leadership tool that would support you in your employee appraisal efforts. During our research, it quickly became clear that although there are many good resources available, it's difficult to provide a tool that works across a wide range of industries. So, that became our goal! Our free tool provides you with a comprehensive list of competencies. As you prepare your employee reviews, choose the categories that apply to your specific situation and you'll be well on your way to preparing for a high quality discussion with each of your team members. The second topic in our six-part series discusses the importance of defining clear Guidelines and Ratings for performance. To download our free sample Performance Appraisal tool, simply subscribe to our free newsletter. You will immediately receive a password that grants access to our entire leadership tools library.